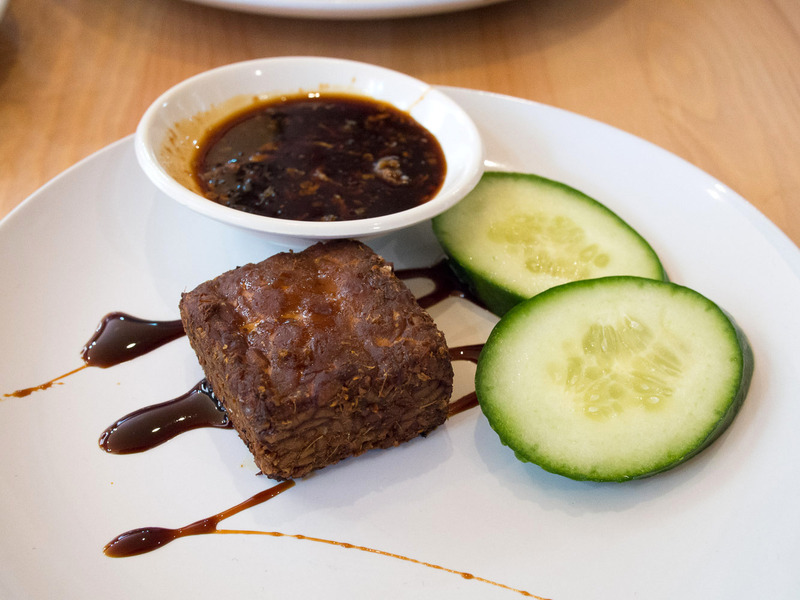 Medan Ciak makes Indonesian food with Chinese flavours and a welcoming family environment. Bring Grandma and the kids, everyone else does. Surry Hills doesn't feature too often in the B-Kyu world. But when a new Indonesian place opened up in East Central that was cooking Indonesian food without the usual Surry Hills trappings (a special 'twist' on a cultural food style or the resto name, fad foods, high prices for simple dishes, a designer fit out) we were in. Yes we know there are low margins and no money in the food business and someone has to be paid for cleaning the deep fryer, but somehow Surry Hills seems to distill everything we find dull and boring in food. Rant over, on to the food. Located at the bottom of a nineties blonde brick apartment building, the decor is low stools and tables, bright unmissable orange signage and grab-and-go desserts on the front counter, simple and easy. 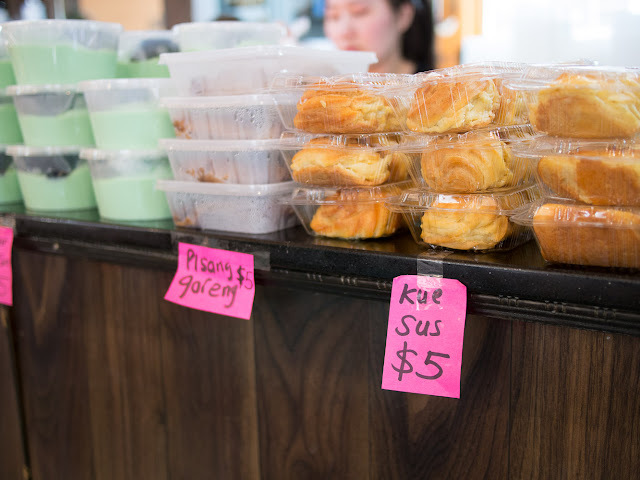 It gets packed on weekends with Indonesian expats in large groups, families and little kiddies, or regulars coming for the weekend specials, ordering up big and enjoying a taste of home. There's a sign up waiting list then, but the queue moves quickly. 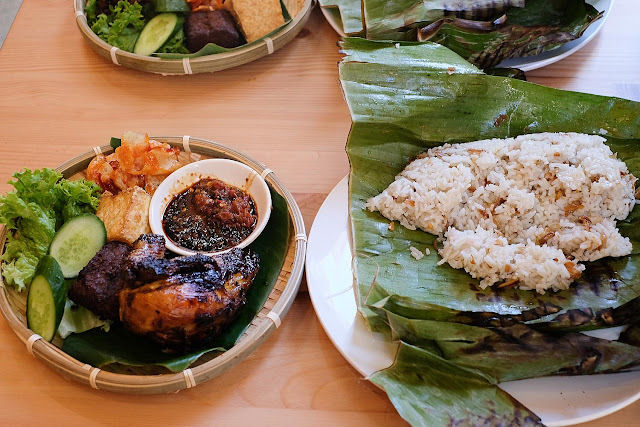 Medan is in the Indonesian island of Sumatra and a large Chinese community means you'll find some differences to other Indonesian cooking styles. Pork is used in many of the dishes, including char sui and dried sausage, which makes a difference in flavour to a fried noodle or soup. 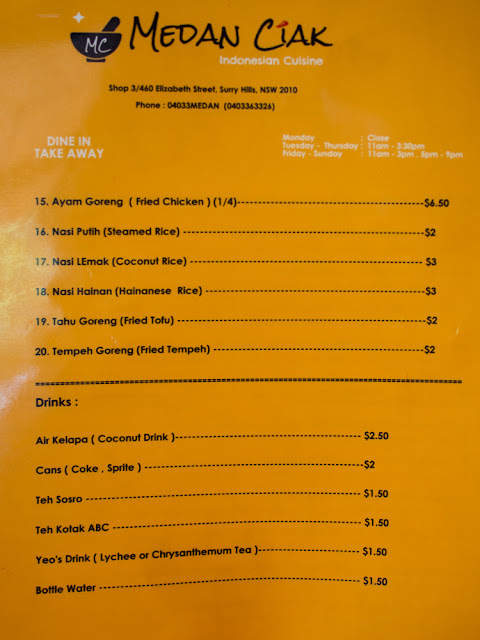 Nasi Lemak Komplit $12. Nice amount of beef rendang, not too runny or tough. The essential mix of iakn bilis for crunch, boiled egg coated in a chilli sambal and a small piece of fried chicken. The rice is superb, not too sweet but possibly cooked in a little stock to give it extra flavour, like the rice in Hainanese chicken rice. The sambal potatoes here are incredible, potato slices coated in sticky chilli sauce and backed to a toffee. 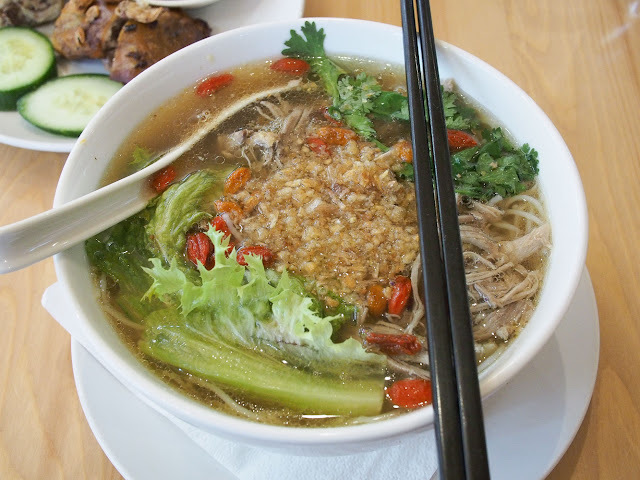 From the weekend specials menu is a duck noodle soup, a deeply flavoured broth with shredded duck and lashings of fried garlic. A side order of ayam goreng (fried chicken, $4.50), just for good measure. It's served with thick sweet soy laced with more fried garlic. Always ask for the thigh piece, it's far juicier than a breast. 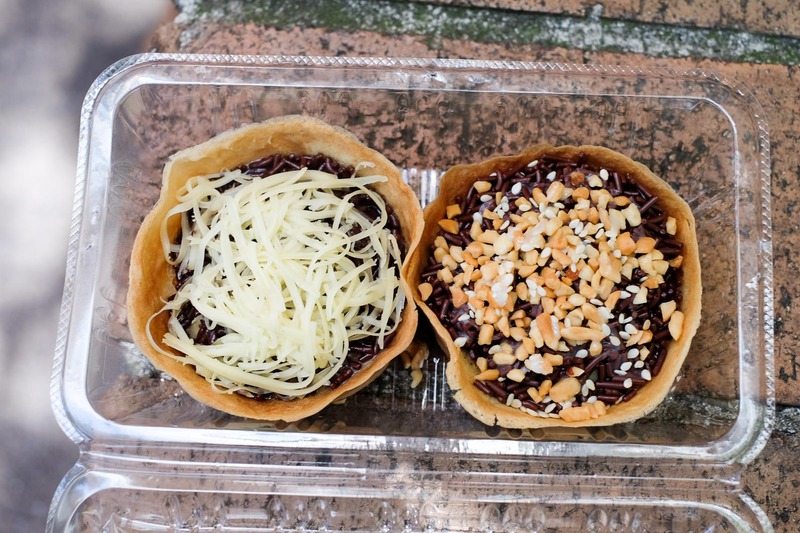 Medan Cah Kwe Tiau, $13. 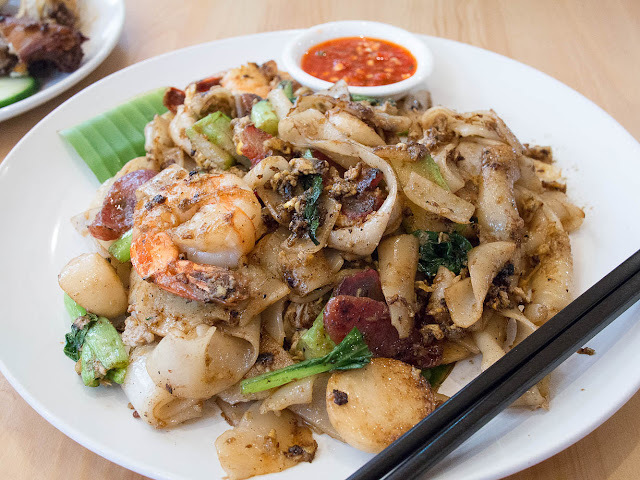 An excellent flat noodle stir fry with BBQ pork, chinese sausage, fat prawns and fish cake. Love the slightly burnt scrapings from the wok bottom. Tempeh goreng, $2. Very dark piece of compressed soy beans, always a side order favourite for us. Another weekend special, nasi uduk bakar komplit. 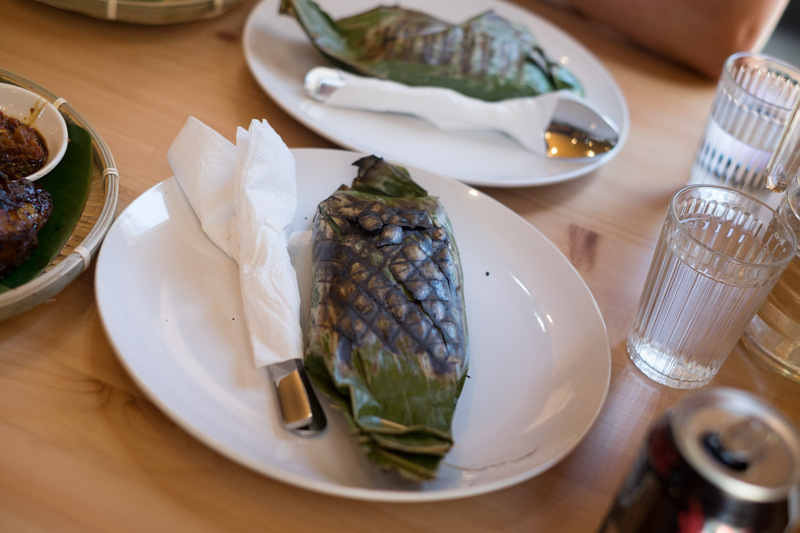 First served is a banana leaf with a criss cross of grill marks across the surface. It's opened up to reveal a prawn flavoured rice, fragrant and delicious. The next part of the meal is another plate filled with ayam bakar, charred chicken pieces with salad and tofu and a side of that wonderful sambal potato. This is also sometimes served on one huge impressive platter. Sweets on the counter tempt you as you pay and leave. We can never get past this point without buying something, guess their clever ploy works! 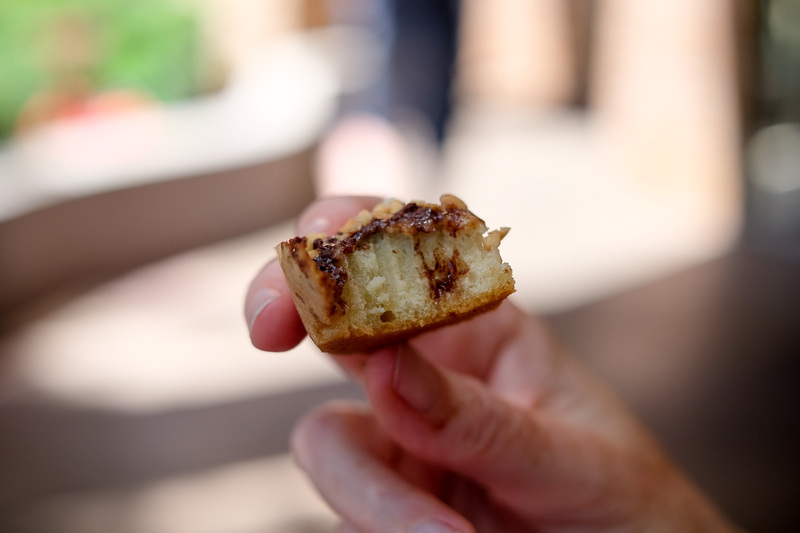 The kue sus were small puff pastries filled with sweet custard. Scoffed before photos I'm afraid. Small murtabak cups in classic flavours of cheese and chocolate and chocolate and peanut. Cheese and chocolate is one of those combos that sounds awful in concept but is wonderful in execution. Avocado and chocolate is the same. 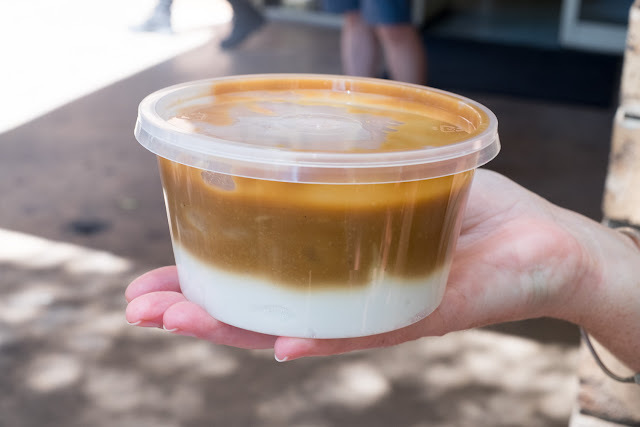 Our favourite has been this burbur sum sum, coconut pudding with a sweet gula malaka topping. We've also tried a pandan burbur as well, so green and sweetly wonderful. 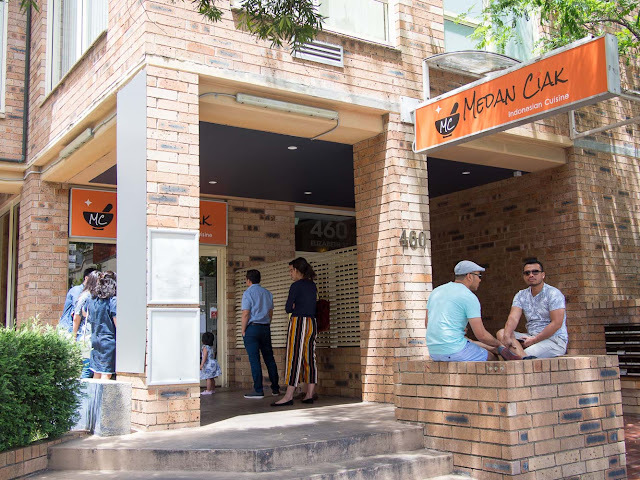 Medan Ciak is at 460 Elizabeth St Surry Hills. Phone 0403 363 326. Look for them on Friendface for their weekend specials. I really need to go back on a weekend. 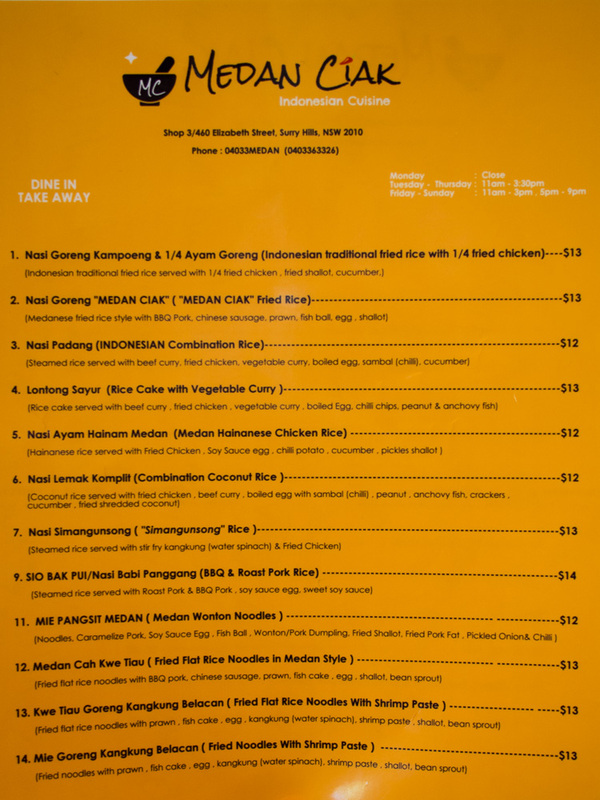 Also, why do you think Indonesian food hasn't kicked off like Thai or Vietnamese? That's a mystery I ponder too. Same with Sri Lankan and Filipino. There was a kind of Bali rush a few years ago but it all seemed to fall over. Filipino I think can be explained by there not being enough Filipino people in Sydney. Sri Lankan is another curious one.